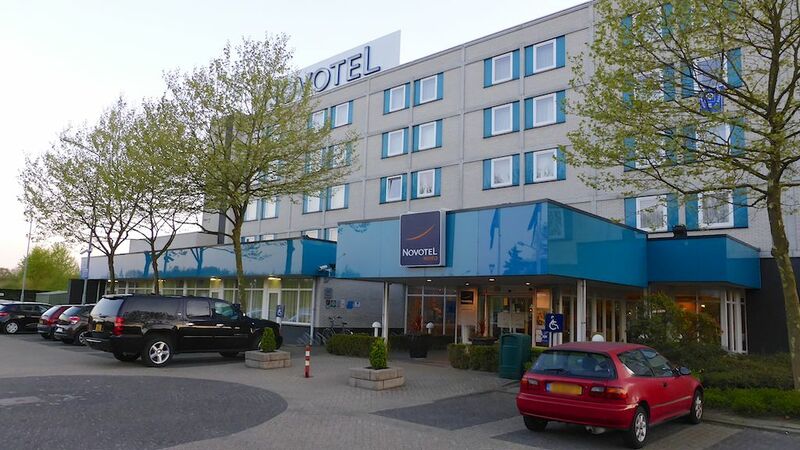 The Novotel Eindhoven is a comfortable family-friendly hotel with rooms sleeping up to four and a swimming pool quietly located near the airport. The Novotel Eindhoven is a comfortable hotel conveniently located in the outskirts of town near Eindhoven Airport and the A2 highway. The hotel is family-friendly with beds for up to four per room and free breakfast for children up to 16 years old. Rooms and furnishings are typical Novotel – bog standard but modern and very comfortable. Fast free wifi is available in all rooms with a computer linked to the internet and printers available for guest use in the lobby. 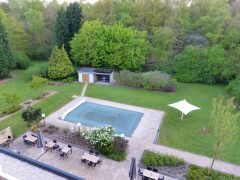 In summer, guests may use the unheated, outdoor swimming pool. The Novotel Eindhoven is typical for this Accor mid-scale hotel chain a rather boxy design but with a modern interior and high levels of comfort at a reasonably price. The Novotel group focus mostly on business travelers, but with bedrooms sleeping up to four, exceptional value is often available over weekends and holiday periods for families and leisure travelers. Bedrooms are spacious but do get a bit cramped once the double-bed sleeping sofa is fold out at night. The walk-in closet at the entrance to the room provides space for suitcases and jackets while the second door helps to cut down drastically any corridor noise that may seep in at night. Rooms have a minibar, tea and coffee making facilities, an in-room safe and individually controlled air conditioning. The television has some English channels in addition to the usual range of Dutch and German channels. The bathroom is well lit and although the separate toilet is useful, the lack of a washing basin here irritates. Sufficient toiletries and towels are provided for a family of four. Free fast wifi without annoying codes is available throughout the hotel. Although near the highway, the Novotel hotel is located inside a green park with plenty of space for children to run around. An outdoors, unheated swimming pool is available when weather allows, as is outdoor seating at the restaurant bar. The breakfast buffet is extensive with typical Dutch breakfast fare including a wide variety of breads, cheese and cold meats in addition to international favorites. At around €18, breakfast is pricey for individuals but prior reservations can often half the price and with children under 16 eating for free with parents breakfast can become a steal for leisure travelers. Some electronic games, toys, and books are available for children in the lobby. A computer connected to the internet and a printer may also be used by guests. The Novotel Eindhoven is located at the outskirts of Eindhoven only around a kilometer from the airport. The hotel is just off exit 29 (Eindhoven Airport) from the A2 highwy (Amsterdam / ‘s-Hertogenbosch to Maastricht). Plenty of parking (small charge) is available. Getting to the hotel is easiest by car but the Novotel can also be reached by bus 401 from Eindhoven CS train station towards Eindhoven Airport. The hotel is around 10 minutes walk along the cycling path from stop Flightforum. No other businesses or buildings are in the immediate vicinity of the Novotel Eindhoven but shops, the airport and Eindhoven are an easy drive away. Reservations are best made directly at the Accor group website with price guarantee and a variety of options – advance reservations and payments often give very low prices and half-price breakfasts. 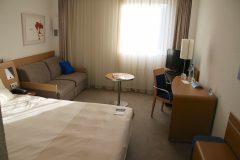 Novotel Eindhoven, Anthony Fokkerweg 101, 5657 EJ EINDHOVEN, The Netherlands, Tel (+31)40/2109000.